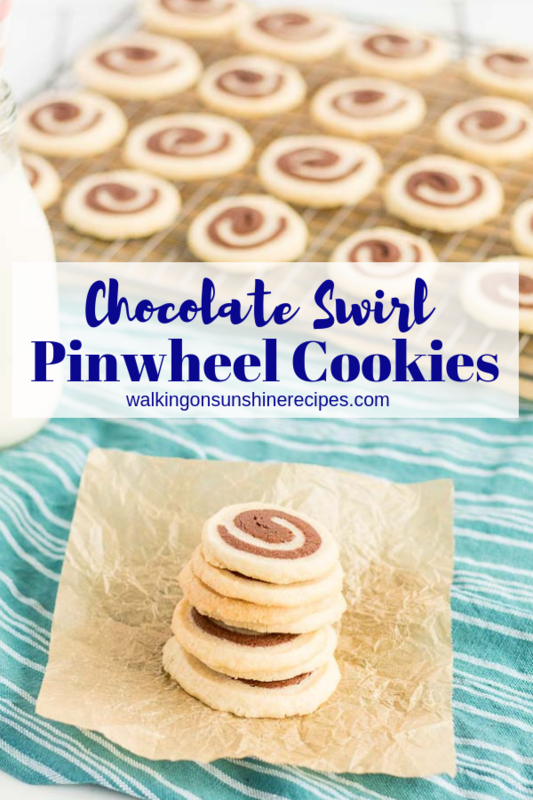 Your family and friends are going to love the swirl design of these beautiful Vanilla and Chocolate Swirl Cookies. 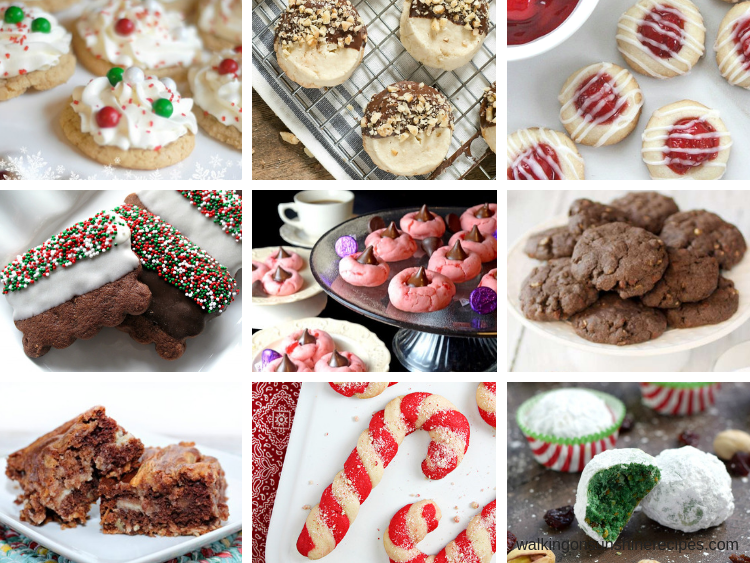 They’ll look amazing in any cookie tray you put together this holiday season. 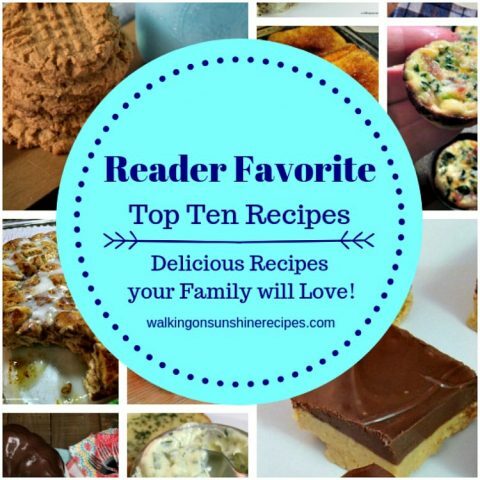 Are you visiting today from Malinda’s blog, Countryside Cravings? Didn’t those Gingerbread Pancakes look amazing? I’m happy you’re joining me today as I continue my 12 Days of Christmas Celebration with these beautiful Vanilla Chocolate Swirl Cookies! 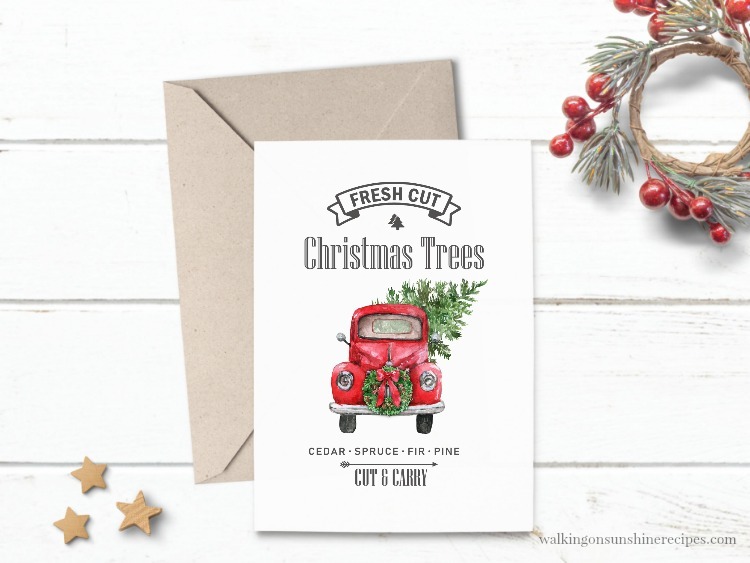 This week I’m joining the Christmas Festival Blog Hop hosted by my friend Kendra at Joy In Our Home! 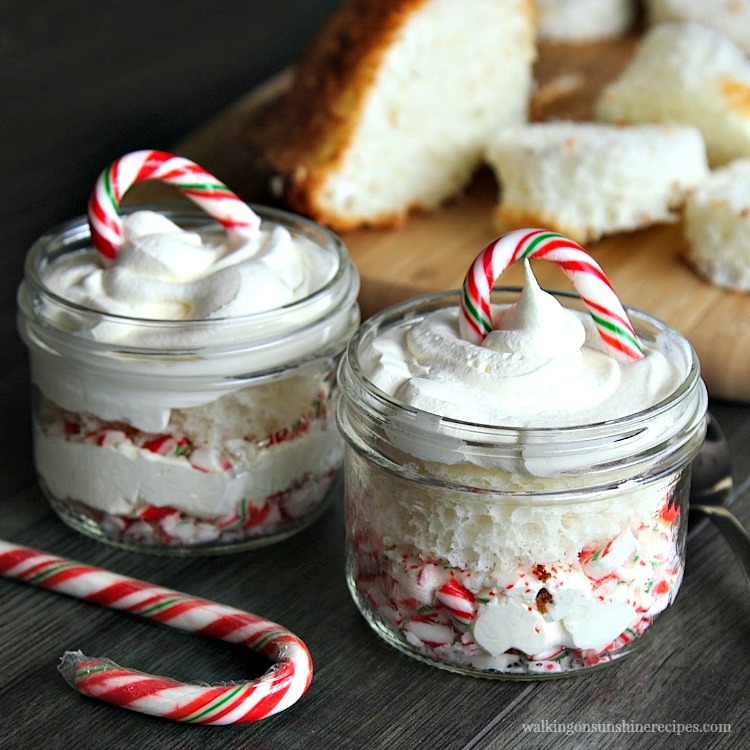 Each day a different blogger is sharing a beautiful Christmas idea or recipe. My contribution is this delicious recipe for Vanilla Chocolate Swirl Cookies. All of the other projects are linked at the end of this post, so make sure you spend a little time checking out what these talented bloggers are sharing with our fun blog hop. 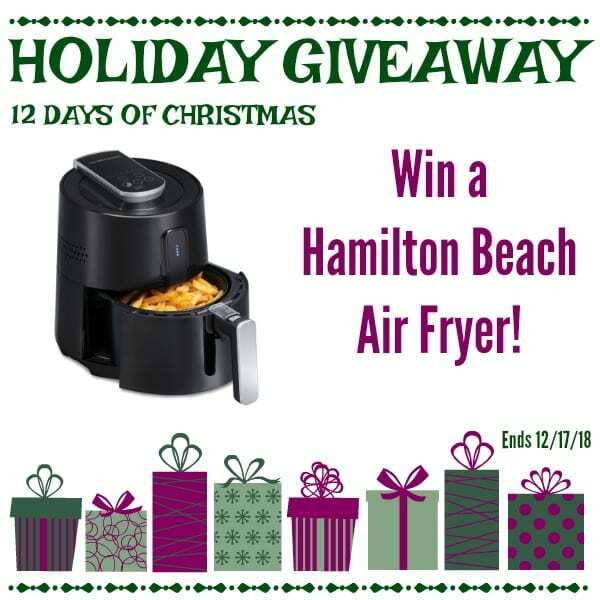 We’re all sharing our best and favorite Christmas ideas with you this week! Please don’t let the lengthy instructions for this recipe scare you away. It’s really an easy recipe to prepare! Make sure you allow the cocoa powder to mix completely with the vanilla dough so it does not have a marbled look. Allow the dough to chill the recommended time. If you try to roll out the layers with warm dough, you will have a mess. If the dough starts to crack while you are rolling the layers together, don’t worry! Just pinch the dough together and keep rolling. Allow the dough to chill a second time before slicing. Once the dough has been rolled up into log shapes, you can freeze it for up to three months. 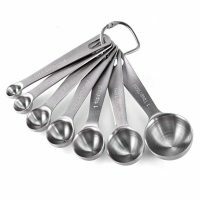 These are my favorite kitchen tools for any cookie recipe. 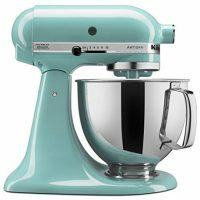 KitchenAid Mixer – really any mixer will do. Even a handheld mixer. But I love my KitchenAid and think it would make a lovely gift this time of year. In the bowl of a stand mixer fitted with the paddle attachment, cream the butter until it’s smooth. Add the sugars and blend until light and fluffy, about 5 minutes. Add the vanilla extract and beat for another minute or until it is combined. Add the dry ingredients to the creamed mixture one third at a time, stirring well after each addition until the dough is evenly blended. Divide the dough in half, keeping one half of the dough in the mixer and setting the other half aside while you prepare the chocolate layer. Add the unsweetened cocoa powder to the mixer and combine until it is fully incorporated. This may take a few minutes, but take your time and make sure the cocoa powder is full incorporated into the vanilla dough so you get a true chocolate color. Remove the chocolate dough from the mixer and divide the chocolate dough into TWO pieces. Form each chocolate piece of dough into 1/2 inch thick squares and wrap them individually in plastic wrap. 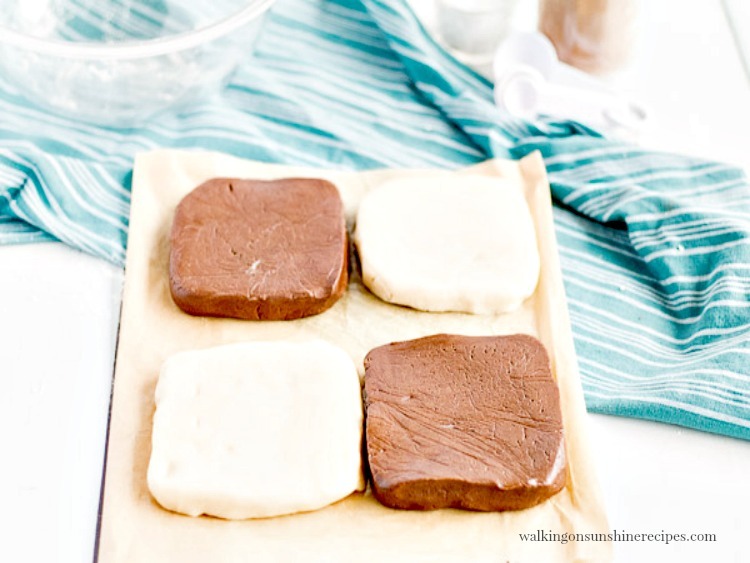 Divide the vanilla dough into TWO pieces, form each vanilla piece of dough into 1/2 inch thick squares and wrap them individually in plastic wrap. You should now have two squares of chocolate dough and two squares of vanilla dough all wrapped individually. Refrigerate all four squares of dough until firm; about one to two hours. Unwrap one piece of the chilled vanilla dough leaving it on top of the plastic wrap. Cover it with a second piece of plastic wrap, then using a rolling pin, roll out the vanilla dough into a rectangle measuring about 9X12 inches. 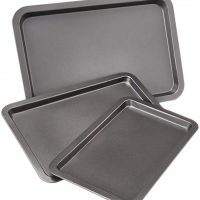 If the dough gets too soft and difficult to roll, simply slide it onto a baking sheet and refrigerate until it’s firm again; no longer than 10 minutes. Unwrap one piece of the chilled chocolate dough, leaving it on top of the plastic wrap. Cover it with a second piece of plastic wrap, and roll it out into a 9X12 inch rectangle shape as well. 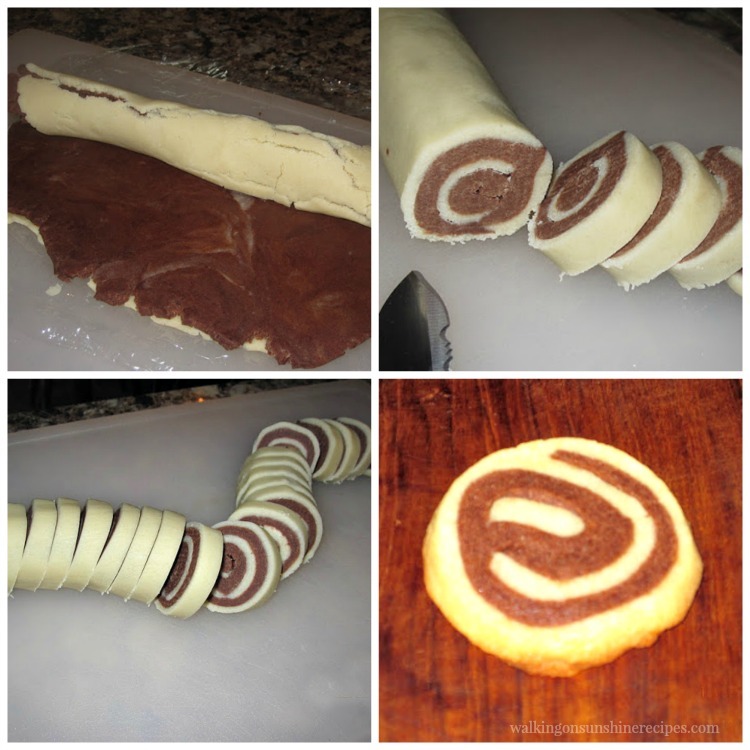 Remove the top pieces of plastic wrap from both the vanilla rolled dough and the chocolate rolled dough. Carefully invert the chocolate dough on top of the vanilla dough. Remove the top piece of plastic wrap from the chocolate dough. Gently roll over the top of both layers with a rolling pin to make the doughs slightly stick together. 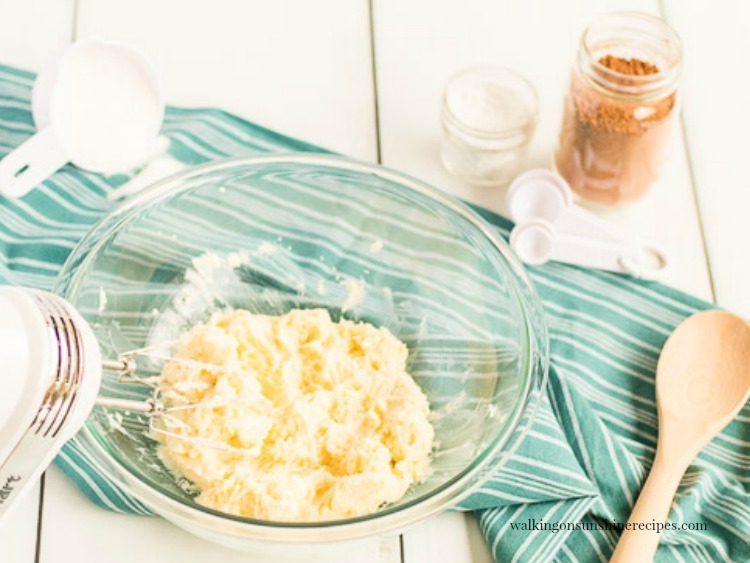 Starting at one end, lift the vanilla dough up by the plastic wrap underneath and roll up the doughs into one big log, pressing gently as you roll to help adhere both layers together and peeling the plastic wrap away as you roll. Wrap the log in a fresh piece of plastic wrap and refrigerate for another 2 hours. Repeat this process with the remaining piece of vanilla and chocolate dough. I promise you, we’re almost done! This is the easy part…slice and bake the cookies! Remove the logs from the refrigerator and remove the plastic wrap. Lay the log on a cutting board and slice into 1/4 inch thick rounds. 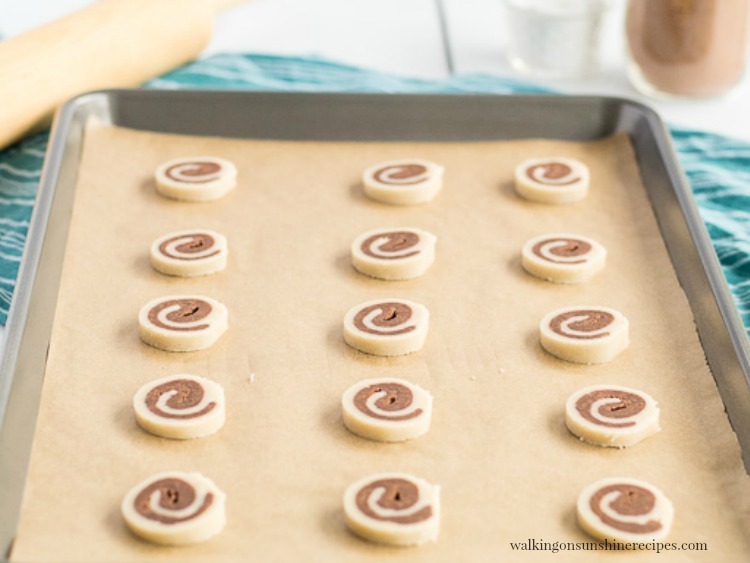 Place the cookie slices onto a baking sheet that’s been lined with parchment paper. 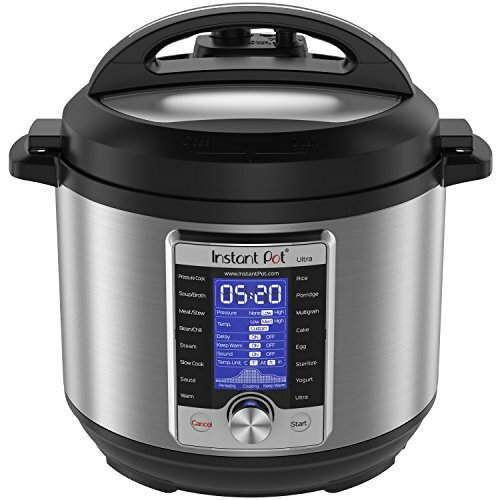 Bake in a preheated 350 degree oven for about 13 minutes. The cookies will still be a little soft to the touch and slightly brown on the edges. Let cool slightly on a baking rack before enjoying! 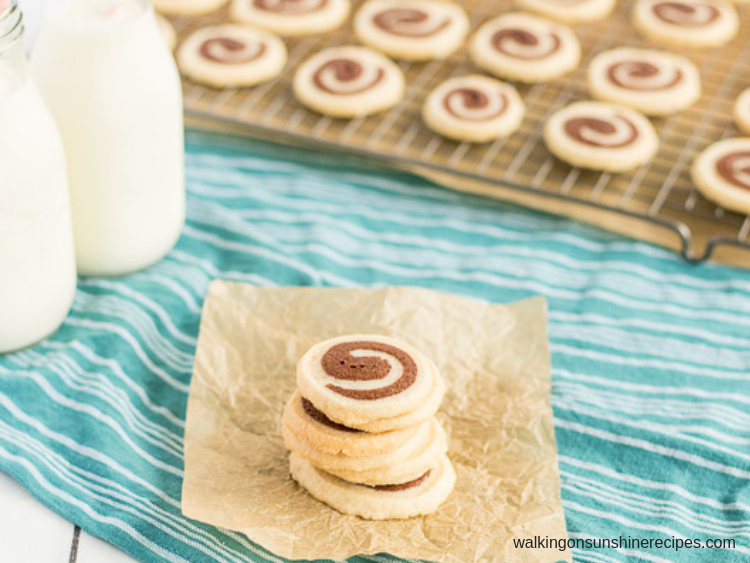 Now, don’t these Vanilla and Chocolate Swirl Cookies look amazing? And they taste pretty amazing too! Beyond the Butter is up next. You don’t want to miss the yummy recipe she’s sharing with you. 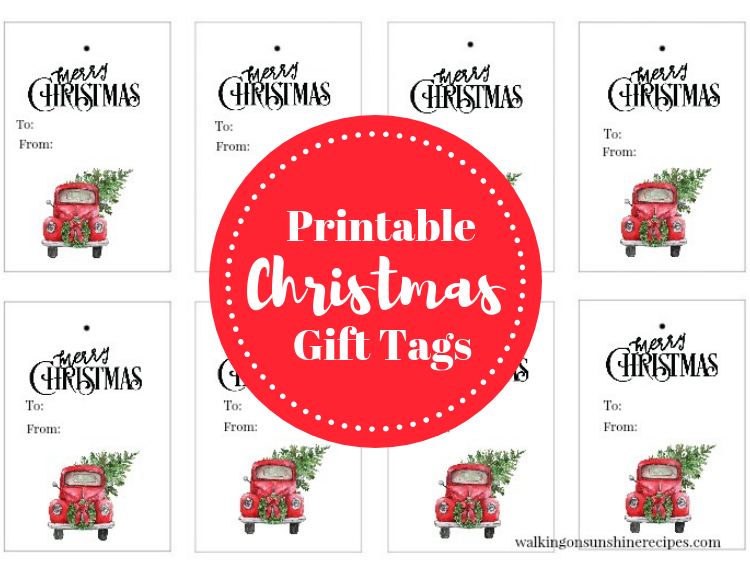 And don’t forget to check out the other Christmas posts by clicking on the links below. Then check back for the rest of the weeks Christmas Festival. 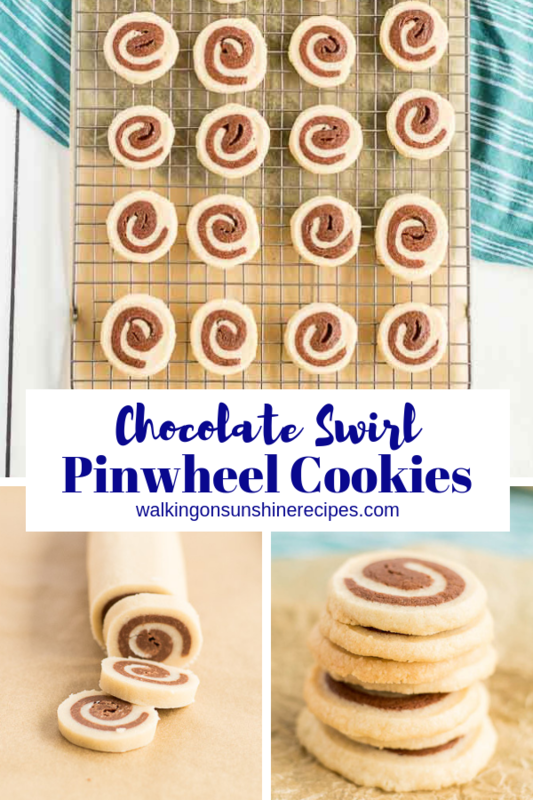 Vanilla and Chocolate Swirl Cookies are a fun pinwheel cookie that your family and friends are going to love! In a medium sized bowl, combine the flour, salt and baking powder together. In the bowl of a stand mixer fitted with the paddle attachment, cream the butter until it's smooth. Add the sugars and blend until light and fluffy, about 5 minutes. Add the vanilla extract and beat for another minute or until it is combined. Add the dry ingredients to the creamed mixture one third at a time, stirring well after each addition until the dough is evenly blended. 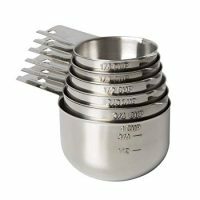 Divide the dough in half, keeping one half of the dough in the mixer and setting the other half aside while you prepare the chocolate layer. 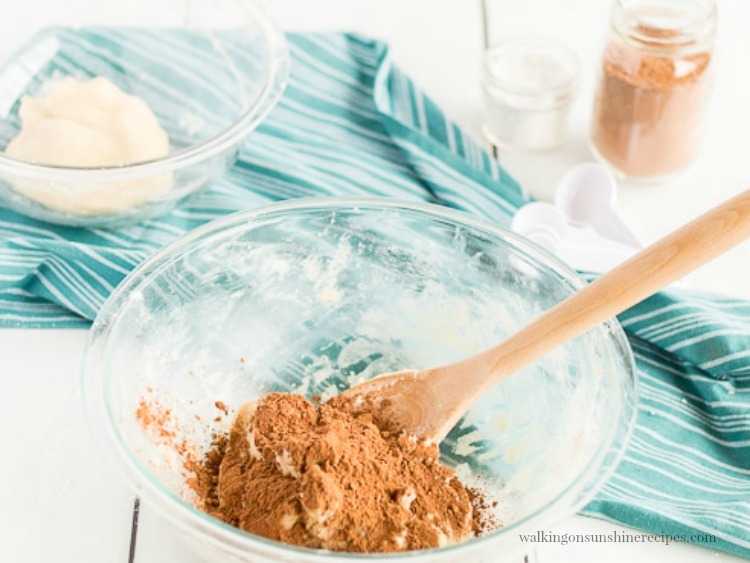 Add the unsweetened cocoa powder to the mixer and combine until it is fully incorporated. This may take a few minutes. Remove the chocolate dough from the mixer and divide the chocolate dough into TWO pieces. Form each chocolate piece of dough into 1/2 inch thick squares and wrap them individually in plastic wrap. You should now have two squares of chocolate dough and two squares of vanilla dough all wrapped individually. Refrigerate all four squares of dough until firm; about one to two hours. Cover it with a second piece of plastic wrap, then using a rolling pin, roll out the vanilla dough into a rectangle measuring about 9X12 inches. If the dough gets too soft and difficult to roll, simply slide it onto a baking sheet and refrigerate until it's firm again; no longer than 10 minutes. Unwrap one piece of the chilled chocolate dough, leaving it on top of the plastic wrap. Cover it with a second piece of plastic wrap, and roll it out into a 9X12 inch rectangle shape as well. Again, if the dough gets too soft and difficult to roll, simply slide it onto a baking sheet and refrigerate until it's firm again. 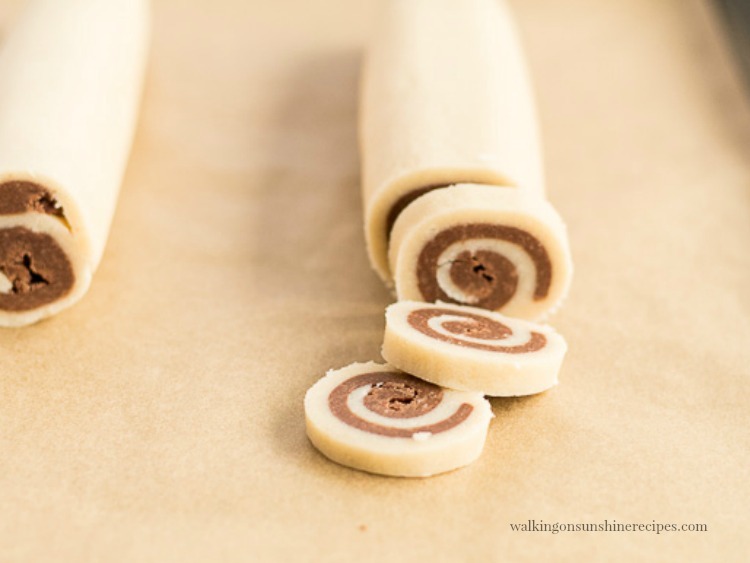 Remove the top pieces of plastic wrap from both the vanilla rolled dough and the chocolate rolled dough. Carefully invert the chocolate dough on top of the vanilla dough. 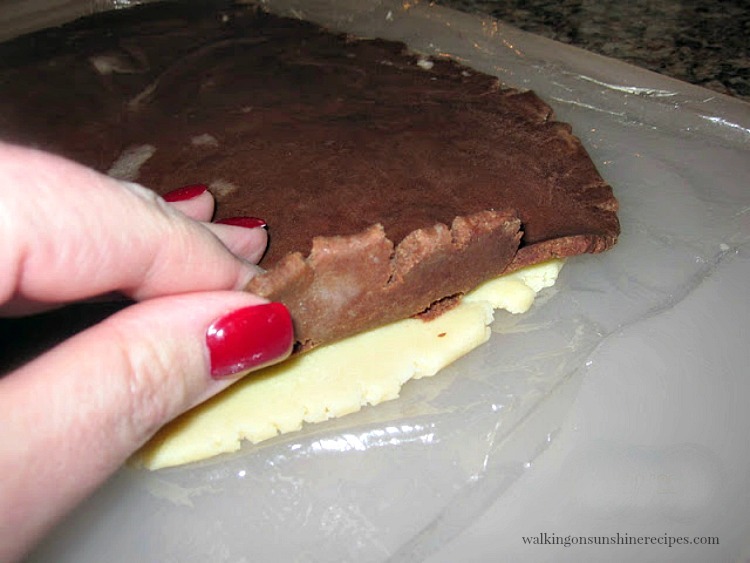 Remove the top piece of plastic wrap from the chocolate dough. Gently roll over the top of both layers with a rolling pin to make the doughs slightly stick together. Wrap the log in a fresh piece of plastic wrap and refrigerate for another 2 hours. Repeat this process with the remaining piece of vanilla and chocolate dough. Remove the logs from the refrigerator and remove the plastic wrap. Lay the log on a cutting board and slice into 1/4 inch thick rounds. Place the slices onto a baking sheet that's been lined with parchment paper. Bake in a preheated 350 degree oven for about 13 minutes. The cookies will still be a little soft to the touch and slightly brown on the edges. What a pretty cookie! It has the best of both worlds swirled into a tempting cookie. Thanks for sharing this recipe. You tempt my tummy every time I stop by. These look so good. OK…I think you love Pinterest as much as I do! Those cookies look so good! Anything having to do with chocolate…I'm in! One of these pretty cookies would be good with a cup of coffee this a.m.!!! Have a wonderful weekend! What a yummy looking cookie. I bet it is tasty too. I don't bake cookies much, but this one might just be the one I try. Three sticks of butter? I bet these are FANTASTIC! I want to make pinwheel cookies from Chicago – kind of pink and vanilla. I bet I could do that with these. And those cheese enchiladas look delish! Both the cookies and chicken look awesome! They look yummy! All your recipes do! It will be interesting and close– what happens tomorrow in the primary! 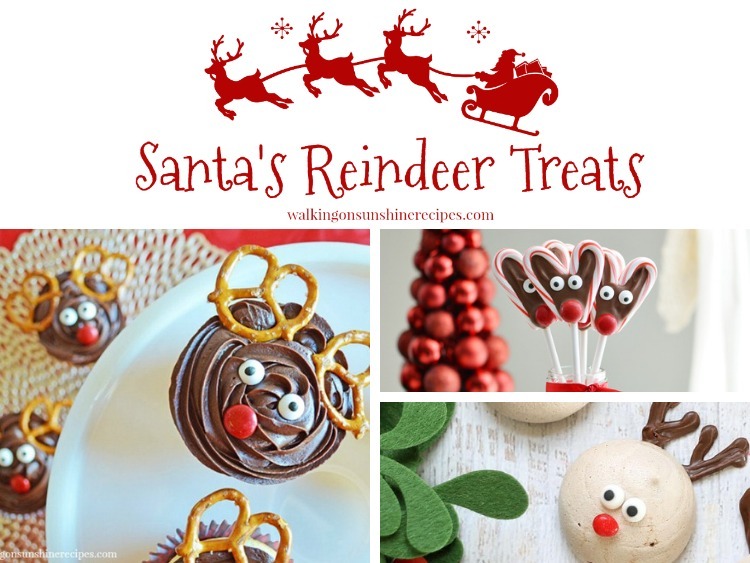 those cookies look fun to make, i may have to try them! isn't pinterest "the bomb"? i'm addicted. Hi Lois, these look so pretty and good! And I've bookmarked this page so I can try out the chicken enchiladas, they will be good for those days when I have some leftover chicken. Thanks for the recipe! Thank you! I always thought they were hard to make as well until I finally decided to try them and was so happy I did. Thanks for visiting! This is the cutest cookie and they sound wonderful! Thank you for sharing! It was fun touring with you this week! Pinning! Thank you Lindsay! I really enjoyed the blog hop as well. These are SO pretty! They’d make for a lovely addition to any Christmas cookie plate 🙂 Thanks for blog hopping with me! Thank you Katherine! 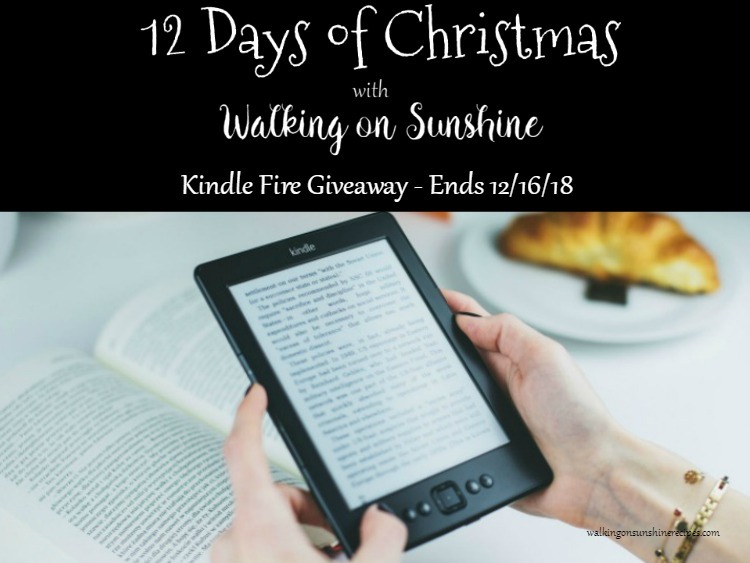 I’m so happy to be included this year in the blog hop! These cookies are the best of both worlds! I especially want to try the chicken recipe. 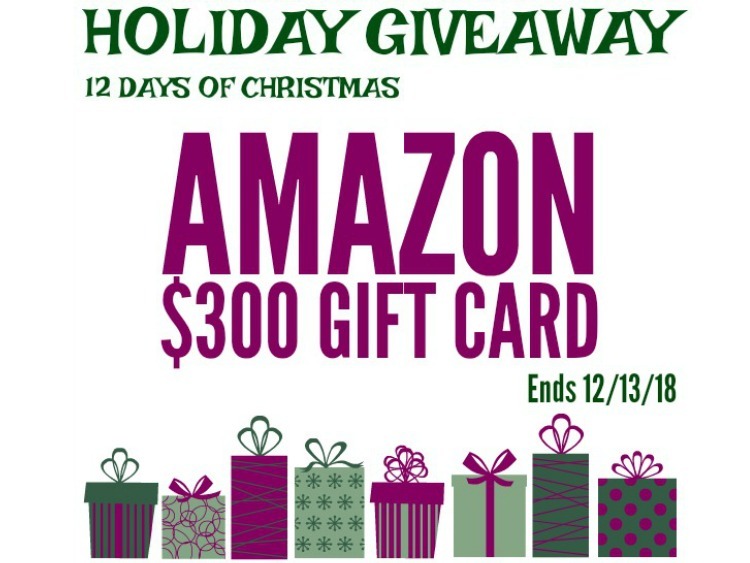 Thanks for sharing & for participating in the give-away. 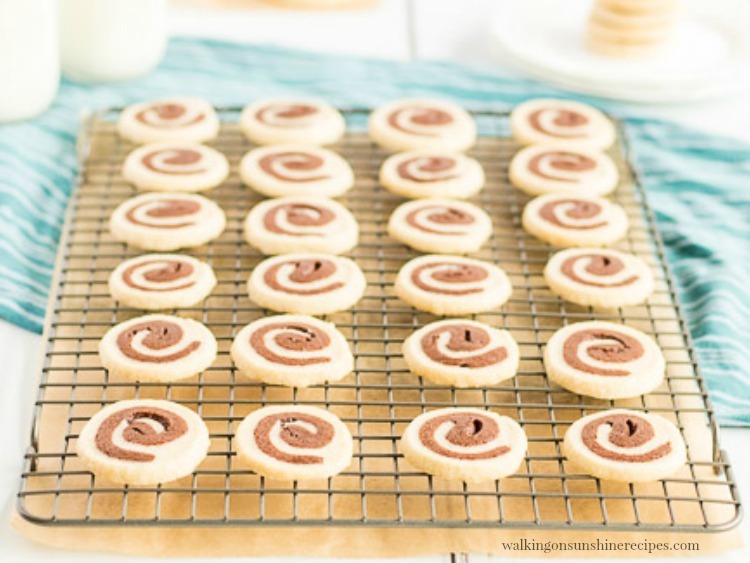 Absolutely love the swirl in these cookies!! 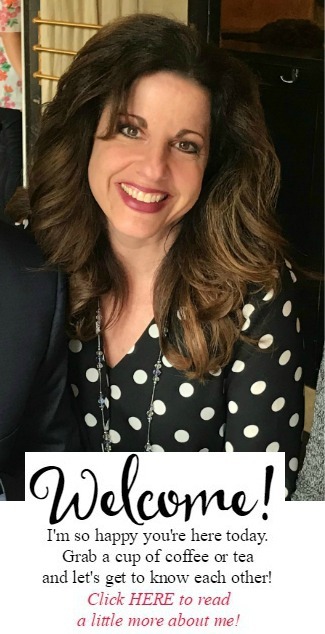 Thanks for visiting Jennifer! Loved joining the blog hop with you today. Love all the inspiration you give!! I can’t wait to try these! Thank you for visiting Kelly and your kind comment. These cookies are so pretty!! And thanks for showing in detail how to make them!! Hi Lois, these are so perfect looking that I would never guess they have not been store bought….thanks so much for sharing the goodness! Wow! Thanks for the compliment. I’ve always wanted to make these but was so intimidated. You make it look easy. Hope to try these next week. Thanks for hopping and sharing! Love this recipe. Thank you Cindy! I was always intimated too. Let me know how they turn out for you! Yum! 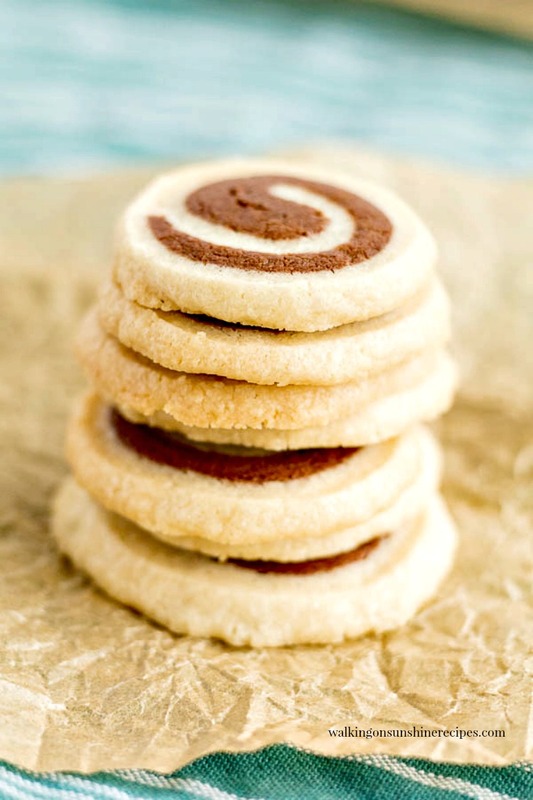 I never think to make swirl cookies, but I may have to try these! These look so delicious Lois! I’m putting them on our cookie list this season! Thanks so much for joining me this week… was wonderful to have you! Thanks for visiting. I loved joining the blog hop as well this year. Thanks for visiting. I hope you enjoy the cookies! And yes, they’re really not that hard!!! These cookies are pretty and look delicious. I can’t wait to try them. Thanks for sharing at Merry Monday. found your great recipe through Wined Down Wednesday. Beautiful step-by-step photos, really helpful! And can taste the cookies now!